Today I was using a combination of dumpcap and Wireshark to run a network forensics investigation against a server that may have been compromised. A couple of malicious files had been reported by the virus scanner, so I had to take a closer look at what it was doing in the network. Actually, dumpcap was already running for a couple of days in front of the firewall using a capture filter set to the server IP, recording everything that the server sent or received to and from the internet. So basically I wanted to separate good from bad traffic, if any, and see what was transferred. I was quite surprised for a moment since I had loaded the much larger trace without a problem. Then I realized that I had used dumpcap to write the file, so it had never been saved by Wireshark itself, and thus there was no Name Resolution Block (NRB) in the original file. Name Resolution Blocks contain FQDNs and IP addresses that had been known to Wireshark at the time of saving the file, which is a big advantage of the new PCAPng file format. You can open the file at a different location and still have the name resolution working – but in this case it worked against me. 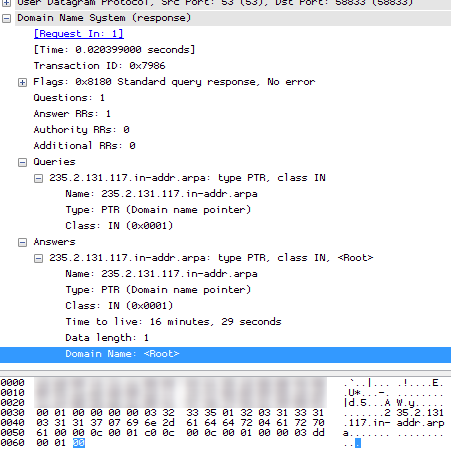 So the answer for the PTR query was a single byte set to zero, which Wireshark seems to take as a “valid” FQDN and write it to the NRB. Which means that it can’t be opened anymore. Leason learned: be careful when enabling network name resolution before saving a file, and: always keep the original capture files so that you can go back to square one. Update: thanks to Guy Harris for fixing the problem! As of build 49854 Wireshark works without a problem. Hey i am a student and currently working on methods to detect p2p botnets. But i am having problem in filtering p2p traffic from normal traffic. I am trying to leverage the fact that p2p clients usually contact thier peers by directly looking up IPs from a routing table rather than resolving a domain name.We can analyse DNS traffic and identify netowrk flows whose destination IPs were previoisly resolved in DNS responses. Doing DNS tracking is a task where Wireshark is probably not going to help a lot, because there is too much manual work involved. What you need is a system that tracks DNS requests and answers as well as TCP/UDP connections being established, so you can determine if there are name resolutions prior to the connection setup. Maybe you can use something like “Passive DNS” to do what you want. Or you could ask your question over at http://ask.wireshark.org to collect more ideas.